Jennifer Perdigao is a partner in Tressler’s insurance practice. Her practice includes insurance coverage and defense as well as non-insurance advisory matters. Jennifer’s insurance coverage experience includes insurance coverage analysis and insurance litigation involving commercial general liability, aviation operations, personal and advertising injury, construction defects, environmental coverage, and professional lines. Jennifer’s defense litigation experience involves a wide range of matters including the defense of wrongful death, personal injury and property damage claims arising out of premises, aviation accidents, airport operations, motor vehicle accidents and products liability. Outside of her legal career, Jennifer is a licensed pilot and enjoys helping young women pursue aviation-related careers. She received her J.D. from Pepperdine University School of law and currently works out of Tressler’s Los Angeles office. I grew up in Manhattan Beach, CA and now live in Hermosa Beach (next town over). Teaching at a tennis camp. How did you know you wanted fly/be a pilot? I always wanted to fly. What’s it like to be a pilot? It is liberating. Also, it is pretty much the only way to get out of LA for a day (or even a weekend) and while there is constant chatter over the radio until you get out of LA, once you are out of LA, it is peaceful. Can you do any cool flying tricks? That’s Mark Banovetz’s area. I do like to fly to Catalina for lunch and sometimes we just go for the chocolate chip cookies. Who taught you how to fly? I learned at the local flight school Beach Cities Aviation and I had two fantastic instructors. Are you currently involved in any pilot or aviation organizations? I am on my third term as Chapter Chair of the Long Beach Ninety-Nines, which is an International Organization of Women Pilots. I am on the Nominating Committee for the Southwest Section of the Ninety-Nines. I am a member of the A&E Flying Club, which is a flying club that owns aircraft that the members fly, and I belong to Women in Aviation. I also belong to the Aviation Insurance Association and was just accepted into the International Aviation Womens Association. My hobbies are pretty much all aviation-related. 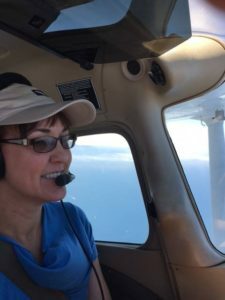 After I got my pilot’s license and got involved in the Ninety-Nines, I realized that I really enjoyed helping young women pursue their pilot or aviation-related careers. I love to help young women, whether its simply taking them flying with me or finding other women who can help them pursue scholarships opportunities or to be their mentors. I also have been working to get younger women involved to help in the way we communicate our chapter through social media. When I first joined the chapter, we had meetings where 3-7 people showed up. Now we have 15-20+ members and have more than 50 total members. This is probably due to the fact that I shortened the meetings considerably and we now have “tech talks” on topics such as flying, mechanics, careers, and safety issues. I brought back our Wings Seminars, which are safety seminars approved by the FAA (kind of like CLE for attorneys). Last fall/winter, I also worked with one of our chapter members to reestablish the Los Angeles Chapter at Santa Monica Airport. My bucket list is long, but next on my list is exploring a bit more of California via plane. There are great places in California that I would love to visit, but never had the time because they were difficult to reach. Since I joined the A&E Flying Club, I have better access to planes and so the destinations are no longer difficult to reach. Also, my dog has taken to flying, so she flies with me now. I would also like to have my own plane one day. Someday, I would like to pick up a car in Germany, drive through Germany and Switzerland and then have the car delivered back to the United States. 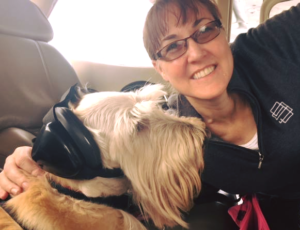 Pictured: Jennifer Perdigao and her canine Co-Pilot, Mackenzie. I am not sure that this would be interesting. I had a friend that suggested a great reality TV show would be following around an aviation attorney and I told him that I really did not want to watch a TV show that involved him answering written discovery! Jennifer Perdigao can be reached at jperdigao@tresslerllp.com. Learn more about our attorneys by visiting https://www.tresslerllp.com/attorneys.